She, the blessed Goddess Mahāmāyā, seizes the minds of even the wise and draws them into delusion. Remembered in distress, you remove the fear from every creature. Remembered by the untroubled, you confer even greater serenity of mind. Dispeller of poverty, suffering, and fear, who other than you is ever intent on benevolence toward all? I adore you, Narayani, who are the good of all good, the auspicious one, to you who accomplish every intent; to you, the refuge, the all-knowing, shining Gauri! I adore you, Narayani, who are intent on rescuing the distressed and afflicted that take refuge in you; to you, O Devi, who remove the suffering of all. O Devi, who exists in the form of all, who are the ruler of all, possessing all power, protect us from fears. 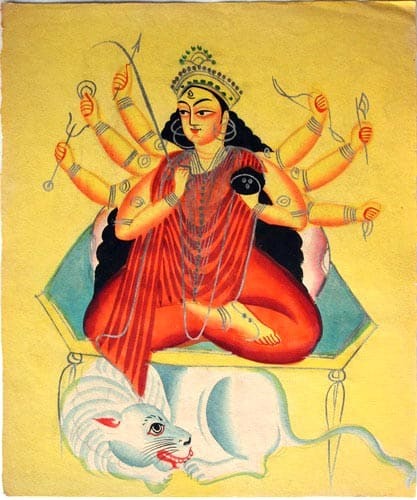 O Devi Durga, I adore you! When pleased you destroy all afflictions, but when displeased you thwart all aspirations. No calamity befalls those who have taken refuge in you, and they who resort to you become a refuge to others. O ruler of all, may you allay all the miseries of the three worlds and so, too, annihilate our enemies. * Translation based on Devadatta Kali, In Praise of the Goddess: The Devi Mahatmyam and Its Meaning (Berwick, ME: Nicolas-Hays, 2003).